The Competition shall commence on 01st May 2018 and will end on 31st August 2018. No entries received after 31st August 2018 will be considered. 4.1. Participants must purchase a Nestle Ricoffy product and a Nestle Cremora product listed below and dial *120*2447# and follow the prompts to stand a chance to win promotional prizes. Prompts will include, but are not limited to, requesting the participant to enter the last 4 digits of the Ricoffy product barcode and the last 4 digits of the Cremora product. 5.1. Participants must purchase a Nestle Ricoffy participating product and a Nestle Cremora participating product listed below and dial *120*546# and follow the prompts to stand a chance to win promotional prizes. Prompts will include, but are not limited to, requesting the participant to enter the last 4 digits of the Ricoffy product barcode and the last 4 digits of the Cremora product. 5.3. USSD sessions are charged from your airtime or billing balance and costs 20c for every 20 seconds you use the service (Free minutes do not apply). The average time for entry is under 20 seconds so your call should not exceed more than 40 seconds. Please ensure you terminate the call when complete in order to stop the call. 5.4.2. Only one prize per household and per person per day of the promotion i.e. within the same family or immediate family residing in the same abode unless proof of purchase can be obtained. 5.4.4. It is reasonably expected that each entry will represent a purchase you have made of the brand and hence an example 3 entries may result in the requirement to produce 3 till slips. 5.4.5. For draw based rewards, till slips for each entry may be required. 5.5. 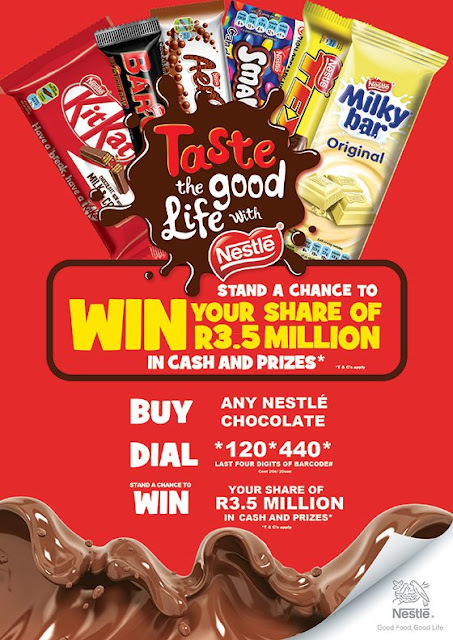 Blocked Participants have an opportunity to call the Nestlé Call Centre on 011 514 6116 or 086 009 6116 between 09h00 – 16h30 Monday to Friday should there be a valid reason, which is accepted by the Promoter, for the Blocked Participants to be allowed to enter the Competition. 5.6. Participants must enter on a phone that is owned and registered to that person. No other person can use another person’s phone for Competition entry purposes. If it is discovered that participants have entered on a phone that is not registered to them they will be disqualified and the entrant will be requested to refund the prizes to promoter. 5.7. The cellphone number is key to all entries, if the entrant has won on a cellphone number they cannot use another number in order to be contacted further, this number needs to be a number that is contactable during office hours. All other costs associated with the use of the vehicle are excluded. not transferrable for Cash. Colour, make and model are to be determined by the brand and cannot be amended by the winner/s. Winners must be over 18 and in possession of a valid South African Driver’s license. The vehicle does not include car insurance and the winners will be required to arrange their own insurance and will be liable for all risks associated with the vehicle after taking delivery. Winners will be required to sign an indemnity form acknowledging this when the vehicle is handed over. The vehicle will be delivered to the nearest selected Dealership in that region where the winner is located. Nestlé, the organisers of the competition and the promoters are not responsible for travel costs for the winner(s) to get to the selected Dealership in that region to collect the vehicle. Winners will be required to bring all relevant documents upon handover of the vehicle. The vehicle will be delivered before the end of the month within which the draw took place. Nestlé will contact a winner should the delivery be delayed for whatsoever reason and the winner shall have no claim against Nestlé for any such late delivery. 6.6. The remainder of the prizes are instant & weekly prizes. 7.1. At the time that a potential prize winner is identified, the potential prize winner will receive a telephone call from a representative of the Promoters at which point he/she may be required to answer a few questions regarding his/her eligibility as well as be requested to submit certain documents such as proof of purchase (receipt/s) and a copy of his/her South African ID and/or driver’s license to the Promoters representative. 7.2. A potential prize winner is not an actual winner at the time of being contacted. Contact is made with a potential prize winner to ensure that the required receipt/s is available. Once the till slip has been supplied and validated, the mobile number of the potential winner is placed into a randomised draw process from which they could be selected as the final winner. The final winner may be required to submit additional documentation as determined by the Promoters. If a potential prize winner does not meet the eligibility requirements, the prize will be forfeited and a redraw will be executed subject to the terms and conditions herein. A potential prize winner will also have 48 hours to produce the relevant documentation before forfeiting the prize and a runner up chosen. 7.3. If the Promotors are unable to reach any of the potential prize winners after 3 (three) attempts made within 3 (three) working days of their mobile number being drawn, for whatsoever reason, including incorrect telephone numbers or inoperative telephone numbers or no answer, such a potential winner will be disqualified and a redraw will be executed. 7.4. Eligible winners will have their prizes delivered, save for the vehicles and instant prizes, should a physical delivery be necessary. Should delivery of the prizes be unsuccessful after 3 attempts the prizes will be stored at TMARC and may be collected by the validated winner. 8.1. The judges’ decision is final, and no correspondence will be entered into. 8.2. The Promoters may require the winner to complete and submit an information disclosure agreement to enable the Promoters to ensure compliance with these Rules. Should the winner be found not to have complied with these Rules, he/she will automatically be disqualified and the prize will be forfeited. Winners may also be required to sign acceptance of prizes and indemnity documents. 8.3. The prize is not transferable, and no substitution or cash redemption of prizes is permitted. The prize will not be handed/awarded to a third party, but only to the verified prize winner. 8.4. The Promoters reserve the right, at their sole discretion, to substitute the prize with any other prize of comparable or greater commercial value for whatever reason. 8.6. Participants may be required to take part in publicity campaigns for broadcast or publishing purposes. Participants shall at all times be entitled to decline the above request. Participants that take part in any publicity will not be entitled to any payment or other remuneration for such publicity or otherwise. All publicity and other materials will be the sole property of the Promoters. 8.7. Nothing in these Rules is intended to, or must be understood to, unlawfully restrict, limit or avoid any rights or obligations, as the case may be, created for either the Participant or the Promoters in terms of the Consumer Protection Act, 68 of 2008 ("CPA"). 8.8. All Participants participate entirely at their own risk. By reading and accepting these Rules, the Participants give consent to these risks and hereby indemnifies and holds harmless the Promoters, their directors, employees and agents of any and all liability pertaining to any damage, cost, injuries and losses of whatever nature sustained as a result of their participation in the Competition and related events and activities, save where such damage, cost, injuries and losses are sustained as a result of the gross negligence or wilful misconduct of any of the Promoters. 8.9. The Promoters, their directors, employees, agents and distributors accept no responsibility and they will not, in any circumstances, be liable to compensate the Participants, or accept any liability for: (a) any inability by the Participant to use the prize in part or at all; (b) the lack of quality or any other aspect of any service which is or should be provided at any venue(s) in relation to the prize; or (c) any personal loss or injury occurring at any venue(s) arising, directly or indirectly, out of the use of the prize. 8.10. The Promoters, their directors, employees, agents and distributors, are not responsible for any misrepresentation (whether written or verbal) in respect of any prize nor in respect of any warranties or undertakings given by any person other than the Promoters themselves. 8.11. The Promoters reserve the right to terminate or extend the Competition at any time. In the event of such termination or extension, all Participants agree to waive (give up) any rights that they may have in terms of the Promotion and acknowledge that they will have no recourse against the Promoters, its advertising agencies, advisors, suppliers and nominated agents. 8.12. By entering the Competition, Participants acknowledge that the Promotion will be managed in accordance with the provisions of the CPA. Participants undertake to expeditiously do all things necessary to enable the Promoters to comply with their obligations under the CPA including, but not limited to providing such personal information as may be required in order to facilitate handing over the prize to the Participant. Should any Participant refuse or be unable to comply with this requirement, the Participant shall be deemed to have forfeited the prize. 8.13. Notwithstanding anything to the contrary contained in these Rules, the Promoters reserve the right to amend, modify, change, postpone suspend or cancel this Competition, the Rules and any prize (which has not yet been allocated), or any aspect thereof, without notice at any time, for any reason which the Promoters deem necessary. At the end of the Competition for whatsoever reason, all of the Promoters’ obligations in regard to the Competition as well as in regard to the prizes shall cease to exist. 8.14. These Rules shall be governed by and interpreted according to the laws of the Republic of South Africa and any Participant and Nestlé consent to the non-exclusive jurisdiction of the High Court of South Africa. 8.15. For further information or enquiries please email our consumer services at consumer.services@za.nestle.com or call us on 086 0096 116. 4.1. Buy any 1 of the 40 Participating Nestle Products and dial *120*440*last 4 digits of barcode# and follow the prompts.